It’s as Southern as fried chicken, especially in the Deep South, and a piece of fried heaven when done right. This authentic recipe, so perfectly seasoned and deep fried to golden perfection for a light, crispy outside and juicy, tender inside, will make you realize how much you’ve been missing out. Because it’s really darn good! Easy and simple. The secret is in the cornmeal, which is perfectly balanced with plain flour so it’s not so ‘crusty’, and seasoned with lemon pepper, garlic, cayenne, salt and pepper for delicious flavor and a perfect crunch. A quintessential southern dish that means family, fun and really good food. So have your own fish fry with some good coleslaw and potato salad or fries, hushpuppies, greens and some sweet tea! Everyone will LOVE this! Perfectly seasoned and a light, golden crispy crust with lemon pepper flavor. Soul-satisfying! Whisk together the eggs, buttermilk, and place into a shallow bowl. Place flour, and cornmeal into another shallow bowl, add seasonings and mix very well (you can also minimize or opt out of black pepper and cayenne if too spicy for you). Dip the catfish fillets into the buttermilk and egg mixture and let the excess drip off. Then dip the fillets into the dry mix and cover the catfish fillets completely. Make sure they are fully coated well. Set aside on a plate. Heat canola oil in a deep frying pan or deep fryer about 3-5 inches deep on medium-high heat. Wait until it’s fully heated then fry the catfish fillets in two’s until they’re golden and crispy. Remove fish from the frying pan and drain on paper towels. 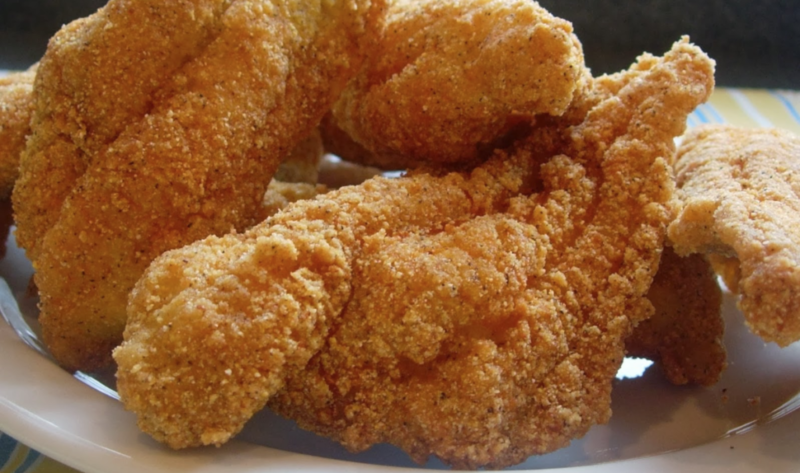 You can also make them into nuggets for the kids to enjoy, or as delicious fish sandwiches. You can also substitute catfish with tilapia or flounder. Want Another Great Recipe? Now Watch How To Make Firecracker Baked Salmon!